On the morning of Aug. 21, 2017, a nurse brought a special gift into 2-year-old Elliott’s room at Children’s Hospital Los Angeles: a pair of eclipse glasses. Just three months earlier, Raquel and her husband, Travis, couldn’t have predicted in a million years that they’d be at CHLA for this eclipse. From the time he was born, Elliott had been thriving—a happy, “chill” baby and toddler who had been growing well and meeting all his milestones. But one morning in the middle of May, the 20-month-old toddler woke up sick. He didn’t want to eat or drink. He was clingy and fussy, and then he threw up. Soon, he was making strange noises while he was breathing. Worried, Raquel took him to his pediatrician, who sent her to a nearby emergency room. A chest X-ray revealed fluid in Elliott’s lungs, and he was admitted to the hospital. The next morning, the doctor on duty—who had once worked at CHLA—ordered an immediate echocardiogram, an ultrasound of his heart. The technician hadn’t even finished the test when the doctor summoned Raquel and Travis out into the hallway. She’d just called Children’s Hospital Los Angeles; an ambulance was on the way. Elliott was in heart failure. Raquel was so stunned, she almost fainted right there in the hallway. Travis, who is 6-foot-8, almost fell on top of her. 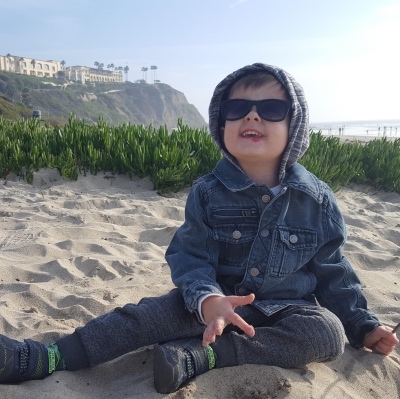 When Elliott arrived at CHLA, he was immediately admitted to the Thomas and Dorothy Leavey Foundation Cardiothoracic Intensive Care Unit (CTICU). A sea of doctors converged on him, inserting a central line so they could administer vital medication for his heart. Elliott was diagnosed with dilated cardiomyopathy, a condition where the heart becomes weak and enlarged and is unable to pump blood well. A brain natriuretic peptide (BNP) blood test measuring his heart function came out in the 4000s; a normal result is under 100. 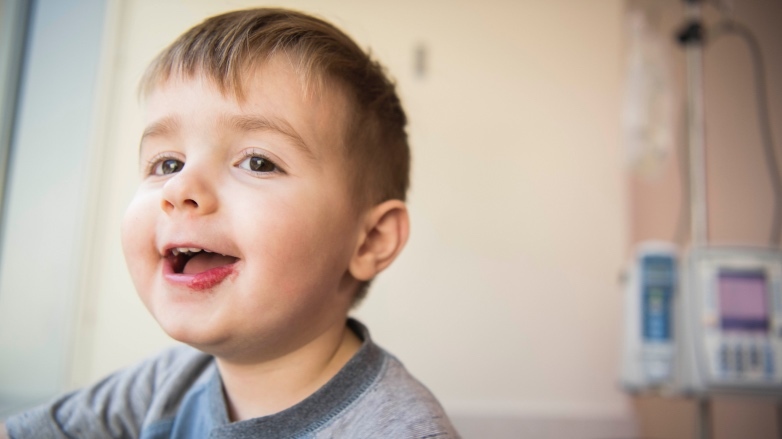 How could a seemingly healthy toddler like Elliott suddenly go into dire heart failure? Doctors don’t know. 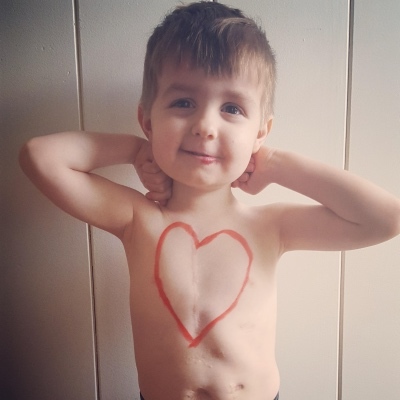 Regardless of the cause, it quickly became clear that Elliott’s only hope was a heart transplant. But a wait for a heart can take months. Elliott’s heart wasn’t going to last that long. Enter the Berlin Heart, the only ventricular assist device (VAD) approved for children by the U.S. Food and Drug Administration. The device is essentially a mechanical pump that takes over the work of the left ventricle—pumping blood to the body and vital organs—and serves as a vital “bridge” to transplant. The pump, though, is not implanted in the body. Instead, surgeons implant flexible tubes in the heart that extend through the skin and connect to the external pump, which is connected to a 200-pound computerized machine that drives it. By the time Raquel was making that total eclipse wish on Aug. 21, Elliott had been on the Berlin Heart for almost three months. It had been, to say the least, a long, hard summer. Elliott spent the first eight weeks in the CTICU, before he was finally strong enough to move to the Cardiovascular Acute unit. His body was weak; he had to learn how to sit up, stand and walk all over again—this time while attached to the Berlin Heart. The family settled into a routine. CHLA become their home, their second family. 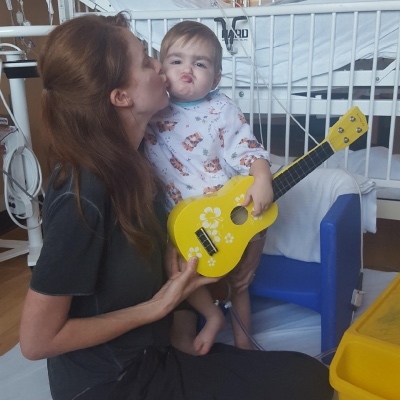 Mixed in with the exhaustion were wonderful moments—like Elliott’s music teacher coming to visit him, playing soothing ukulele and guitar and bringing him instruments to help with his occupational therapy. And there was the moment Raquel and Travis were able to hold their son for the first time in six weeks. “It was like holding him for the first time all over again,” his mom says. Around 4 p.m. on the day of the total solar eclipse, Raquel was watching a movie with Elliott in his room when one of the transplant nurses walked in. “The best part of my job is telling parents we’ve found a donor,” the nurse said. Raquel’s jaw dropped. You mean—? She and Travis started celebrating. She ran to tell the nurses in the CTICU. She was elated—and then, just as suddenly, a wave of sadness came over her. Elliott was wheeled into surgery the next morning. 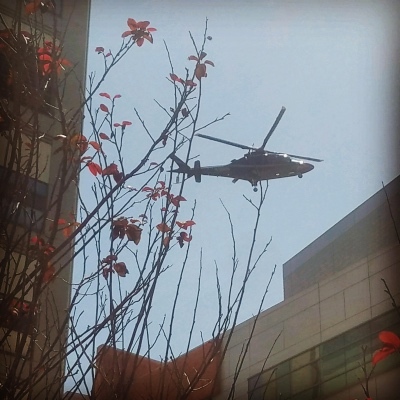 Around noon, Raquel and Travis and a few close family members were outside the hospital’s HBO Café when a helicopter approached CHLA. They ran to get a better view. Elliott’s surgery, led by Ram Subramanyan, MD, PhD, went smoothly. But soon after surgery, Raquel and Travis had to endure one more scare: Elliott’s new heart was failing—a condition called graft dysfunction. The new heart wasn’t pumping strongly enough. Dr. Subramanyan and the team took him back into surgery and reopened his chest—an emergency measure that ensured Elliott could be immediately connected to extracorporeal membrane oxygenation (ECMO), a heart-lung bypass support system, if his new heart gave out. Luckily, that wasn’t needed. After he came out of the operating room, the CHLA team started him on additional medications, including insulin (he had very high glucose levels). His heart function quickly improved. Six weeks later, on Oct. 4, 2017, the family finally went home. Today, Elliott is 3 ½ and doing great. He’s extremely gregarious, smiles and says hi to everyone, and adores playing outside in the dirt with his toy trucks and beloved toy space shuttle. He has energy to spare. Raquel and Travis want to express their gratitude to CHLA—the nurses, doctors, surgeons, Child Life specialists and the entire Heart Institute team who walked hand-in-hand with them on this most difficult of journeys. She thinks about the donor family every day. She knows it was that family’s courage and generosity—amidst gut-wrenching grief—that gave her son his second chance.